You may have heard that the Archdiocese of Philadelphia is closing churches. It has been in the news of late but there has been very little follow-up except to say that people are naturally unhappy. Frankford (a neighborhood in Northeast Philadelphia with a population of about 50,000) is in a unique situation in that the two churches in the heart of Frankford, Mater Dolorosa and St. Joachim, are both being closed. They are within a few blocks of one another and both are in the the poorest area of Frankford. However, both of those churches are financially independent thanks to the astute financial management of their pastors, Father John Large and Father Steve Wetzel. During the period while this issue was being studied, people in Frankford thought that the two churches would eventually have to merge. They were prepared for that likelihood but the announcement that both would be closed was sad and puzzling. So, naturally, they are asking a very simple question of Archbishop Charles Chaput. 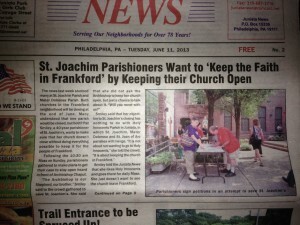 Why is the Archdiocese closing two financially sound parishes and abandoning the Catholic population in Frankford? They are being cut loose without the slightest care for the hardships the parishioners may endure as a result of this callous treatment by their Church. Many are seniors on fixed incomes. Some are physically disabled. All are the faithful that have stuck with their church over these past years of scandal and shame caused by that same Archdiocese. Now they are being treated like criminals rather than the victims of a money driven Archdiocesan Planning Committee. So what happened to bring this about? Father Tom Higgins, Pastor of Holy Innocents Catholic Church and Dean of Deanery 12, Lower Northeast Philadelphia, has indicated that he made a proposal to the Archdiocesan Strategic Planning Committee to close one of the Frankford parishes and merge the other into it. He has said that he believed Frankford should retain a Catholic Church. His proposal was rejected. He then offered an alternate proposal to close both parishes and merge them into St. Bartholomew in Wissinoming. That also was rejected. The end was dictated by the Archdiocesan Planning Committee that both Churches along with another, St. Joan of Arc, would all be merged into Holy Innocents. Well, if they did not listen to the Dean, who did they listen to? It might have been the cash register. We can’t say for sure but that is the only reasonable explanation for this crazy idea. It’s like a corporate raider has taken over the Catholic Church. The parish’s assets are worth more liquidated than operating. Those stained glass windows in these old churches alone are of significant value. The land and buildings, even in Frankford, are going to bring in cash. Given that the Archdiocese is bleeding red ink, this makes it too tempting. Why leave these working class parishes continue when their assets can be put to use supporting other favored projects, like paying off lawsuits, legal fees and making up the deficient pension system for retiring priests. Sounds like Gordon Gecko in a Roman collar. For their sake, let’s hope that Jesus doesn’t turn up at 222 N. 17th street any time soon. I can’t imagine he would approve that the occupants have placed the god of money above the welfare of souls. Father Thomas Higgins, Pastor of Holy Innocents, reached out to Bob and Pat Smiley, the Transition Team representatives from St. Joachim. The Smileys were invited to meet with Father Higgins at the parish rectory. We met today. The beginning of the meeting was very cordial with Father asking how everything was going and we asking about his work. Father shared with us, as he has said from the beginning, that he believed there should be a Catholic presence, a church, in Frankford. This pastoral planning process was long and arduous for all. That we can all agree on! Father told the Smileys that he had made two proposals himself suggesting first that St. Joachim merge at Mater Dolorosa and St. Joan of Arc at Holy Innocents. When that was not accepted, Father tried again with St. Joachim and Mater Dolorosa merging with St. Bartholmew and St. Joan of Arc merging with Holy Innocents. Again, that was not accepted. The Smileys thanked Father for his efforts and believe that someone in the Archdiocese will have the wisdom to overturn this unfair and unjust decision. As it became clear that the Smileys would not cease trying to “Keep the Faith in Frankford” by keeping one Church open in Frankford, Father expressed concerns that the Smileys would not be able to truly “be on the same page” with Father and the rest of the Transition Team. The Smileys, especially Pat, restated their committment to helping in this important process while acknowledging that, according to Father, we wanted the same thing, a Catholic presence in Frankford. Pat Smiley asked if either Smiley had done anything to warrant or cause these feelings. Emails Father has received from the Archbishop, Monsignor Rodgers and the latest article from the “Juniata News” titled “St. Joachim Parishioners Want to ‘Keep the Faith in Frankford’ by Keeping Their Church Open are evidence of the successful efforts that St. Joachim parishioners and supporters have demonstrated regarding the unfair and unjust decision to close St. Joachim. Father indicated that we were not accepting of the Archdiocesan decision to merge our parish. Father felt this gap was too big to be able to be bridged and he was not comfortable with the Smileys remaining on the Transition Team. As of today, the Smileys are no longer on the Transition Team. The Smileys expressed regret that Father felt this way and wish the entire Transition Team and staff of Holy Innocents only the best and many blessings on their efforts.